Hi Dinner Party readers—Kristina here from Uniformly Dressed. Trying something new today: a guest post for DP’s One-Oh column to talk about my tentative foray into the daunting megabusiness of modern skincare, which still makes its fortune in reminding you of the flaws you must necessarily cleanse, exfoliate, and moisturize away. Here’s some of the products that have thankfully been an aid, not detriment, in my descent into madness—ahem, self-care. 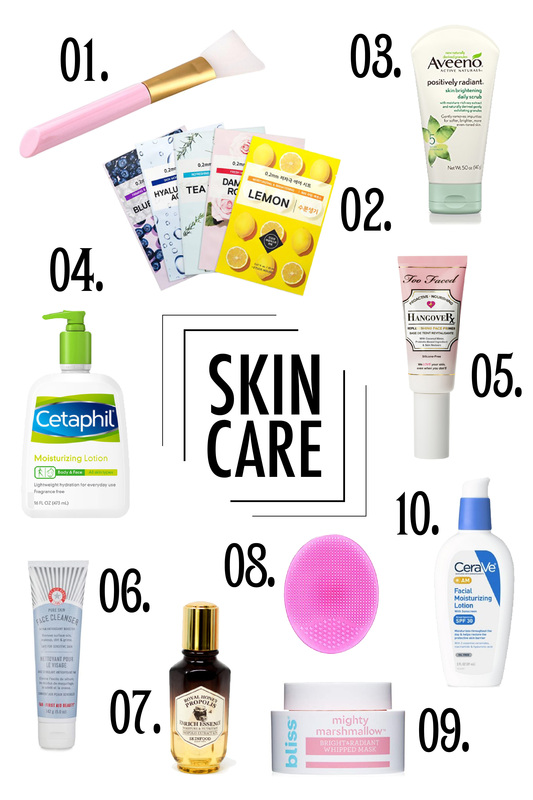 Unsurprisingly, most of my favorites are definitely not “Instagrammable” but have been quiet soldiers of skin protection and moisture, as in the CeraVe and Cetaphil lotions I blindly reach for on most days. I used to layer the CeraVe AM lotion under my makeup, but since there’s SPF in a lot of BB creams nowadays, I switched to lightweight moisturizing primers such as the TooFaced Hangover face primer, which adds a little more hydration for the day. The Aveeno daily scrub is helpful for gentle exfoliating in the shower. This year, I added the silicone brush because I started trying clay masks, which are messy and fun but get everywhere, and the scrub pad to help cleanse the face at night after work. I also picked up a mini jar of the Bliss Marshmallow whipped mask as a treat ($3.99 for the travel jar), and while I haven’t particularly noticed any brightening or added radiance due to application, the pillowy texture of the mask is pleasant and fun enough to use occasionally. As far as “high end” skincurr, I tend to favor the K-beauty side of the spectrum. I’ve come to love the honey/propolis ampoules in my routine; there are quite a few out there—I considered CosRx, Tosowoong, LeeJiham and Nature Republic’s ampoules in my search—but Skinfood was the first I’ve tried, and I’ve stuck with it. Honey’s antibacterial, anti-inflammatory properties are supposed to help restore acne-prone skin to a healthier state. I personally just like the way it feels and absorbs. It also seemed to help soothe sunburnt skin in the summer, or at least prevent lobster cheeks after a day of being outside and not reapplying SPF. I also think Korean brands slay the sheet mask market; the essence/formula on the mask gives superior hydration compared to Western brands. Now every time I know someone is about to go on a trip to Southeast Asia, the number one souvenir I ask for is K-beauty sheet masks! Check out Etude House, Nature Republic, Tonymoly, Skinfood, and Innisfree for some great options.